This article is about the National anthem of India. For other uses, see Jana Gana Mana (disambiguation). Jana Gana Mana (Hindi: [dʒənə gəɳə mənə]) is the national anthem of India. It was originally composed as Bharoto Bhagyo Bidhata in Bengali by poet Rabindranath Tagore. The first stanza of the song Bharoto Bhagyo Bidhata was adopted by the Constituent Assembly of India as the National Anthem on 24 January 1950. A formal rendition of the national anthem takes approximately fifty-two seconds. A shortened version consisting of the first and last lines (and taking about 20 seconds to play) is also staged occasionally. It was first publicly sung on 27 December 1911 at the Calcutta (now, Kolkata) Session of the Indian National Congress. Sheet music for "Jana Gana Mana"
The poem was first publicly recited on the second day of the annual session of the Indian National Congress in Calcutta (now Kolkata) on 27 December 1911, and again in January 1912 at the annual event of the Adi Brahmo Samaj., however, it was largely unknown except to the readers of the Adi Brahmo Samaj journal, Tattwabodhini Patrika. The poem was published in February 1905 under the title Bharat Bhagya Bidhata in the Tatwabodhini Patrika, which was the official publication of the Brahmo Samaj with Tagore then the Editor. In 1912 Song was performed by Sarala Devi Chowdhurani, Tagore’s niece, along with a group of school students, in front of prominent Congress Members like Bishan Narayan Dhar, Indian National Congress President and Ambika Charan Majumdar. Outside of Calcutta, the song was first sung by the bard himself at a session in Besant Theosophical College in Madanapalle, Andhra Pradesh on 28 February 1919 when Tagore visited the college and sung the song. The song enthralled the college students while Margaret Cousins, then vice-principal of the college (also an expert in European music and wife of Irish poet James Cousins), both requested Tagore to create an English translation of the song and set down the musical notation to the national anthem, which is followed only when the song is sung in the original slow rendition style. 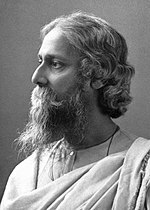 Tagore translated the work into English while at the college on 28 February 1919, titled The Morning Song of India – via Wikisource. . The college adopted Tagore's translation of the song as their prayer song which is sung till today. Before it was the national anthem of India, "Jana Gana Mana" was heard in the film Hamrahi (1945). On the occasion of India attaining freedom, the Indian Constituent Assembly assembled for the first time as a sovereign body on 14 August 1947, midnight and the session closed with a unanimous performance of Jana Gana Mana. The members of the Indian Delegation to the General Assembly of the United Nations held at New York in 1947 gave a recording of Jana Gana Mana as the country’s national anthem. The song was played by the house orchestra in front of a gathering consisting of representatives from all over the world. The National Anthem of India is played or sung on various occasions. Instructions have been issued from time to time about the correct versions of the Anthem, the occasions on which these are to be played or sung, and about the need for paying respect to the anthem by observance of proper decorum on such occasions. The substance of these instructions has been embodied in the information sheet issued by the government of India for general information and guidance. The approximate duration of the Full Version of National Anthem of India is 52 seconds and 20 seconds for shorter version. The poem was composed in a literary register of the Bengali language called sadhu bhasa. The song has been written almost entirely using nouns that also can function as verbs and has commonality with all major languages in India due to Sanskrit being their common source of formal vocabulary. Therefore, the original song is quite clearly understandable, and in fact, remains almost unchanged in several widely different Indian languages (if variations in inherent vowel and pronunciation of approximants and some sibilants are ignored). Jaya he, Jaya he, Jaya he, jaya jaya jaya jaya he. Jana-gaṇa-mana adhināyaka jaya hē Bhārata-bhāgya-vidhātā. Jana gaṇa maṁgala-dāyaka jaya hē, Bhārata bhāgya vidhātā. Translation by Tagore, dated 28 February 1919 at the Besant Theosophical College. Refer to The Morning Song of India – via Wikisource. for the translation of the full poem. Primary sources available in the "Gallery" section. In Kerala, students belonging to the Jehovah's Witnesses religious denomination were expelled by school authorities for their refusal to sing the national anthem on religious grounds, although they stood up respectfully when the anthem was sung. The Kerala High Court concluded that there was nothing in it which could offend anyone's religious susceptibilities, and upheld their expulsion. On 11 August 1986, the Supreme Court reversed the High Court and ruled that the High Court had misdirected itself because the question is not whether a particular religious belief or practice appeals to our reason or sentiment but whether the belief is genuinely and conscientiously held as part of the profession or practice of a religion. "Our personal views and reactions are irrelevant." The Supreme Court affirmed the principle that it is not for a secular judge to sit in judgment on the correctness of a religious belief. "There is no provision of law which obliges anyone to sing the National Anthem nor is it disrespectful to the National Anthem if a person who stands up respectfully when the National Anthem is sung does not join the singing. Proper respect is shown to the National Anthem by standing up when the National Anthem is sung. It will not be right to say that disrespect is shown by not joining in the singing. Standing up respectfully when the National Anthem is sung but not singing oneself clearly does not either prevent the singing of the National Anthem or cause disturbance to an assembly engaged in such singing so as to constitute the offence mentioned in s. 3 of the Prevention of Insults to National Honour Act". In some states, it is mandatory that the anthem must be played before films played at cinemas. On 30 November 2016, the Supreme Court ordered that all cinemas nationwide must play the national anthem, accompanied by an image of the flag of India, before all films, and that patrons were expected to stand in respect of the anthem. This was intended to instill "committed patriotism and nationalism". The order was controversial, as it was argued that that patrons who chose not to participate would be targeted and singled out (as was the case in an incident publicized in 2015, which purported to show a group of patrons (identified by the YouTube uploader as allegedly being Muslims) being heckled by other patrons for not standing during the anthem. On 10 February 2017, two Kashmiris (which included an employee of the state government) were arrested under the Prevention of Insults to National Honour Act, 1971 for not standing during the anthem at a cinema, in the first such arrest of its kind made by a state government, and other incidents of violent outbreaks associated with . A cinema club in Kerala (whose film festival was required to comply with the order, leading to several arrests) challenged the order as an infringement of their fundamental rights, arguing that cinemas were "singularly unsuited for the gravitas and sobriety that must accompany the playing of the national anthem", and that the films screened would often "be at odds with sentiments of national respect".In October 2017, Justice Dhananjaya Y. Chandrachud questioned the intent of the order, arguing that citizens "don't have to wear patriotism on our sleeve", and it should not be assumed that people who do not stand for the anthem were any less patriotic than those who did. In January 2018, the order was lifted, pending further government discussion. "On the first day of 28th annual session of the Congress, proceedings started after singing Vande Mataram. On the second day the work began after singing a patriotic song by Babu Ravindranath Tagore. Messages from well wishers were then read and a resolution was passed expressing loyalty to King George V. Afterwards the song composed for welcoming King George V and Queen Mary was sung." On 10 November 1937, Tagore wrote a letter to Mr Pulin Bihari Sen about the controversy. That letter in Bengali can be found in Tagore's biography Ravindrajivani, volume II page 339 by Prabhatkumar Mukherjee. "A certain high official in His Majesty's service, who was also my friend, had requested that I write a song of felicitation towards the Emperor. The request simply amazed me. It caused a great stir in my heart. In response to that great mental turmoil, I pronounced the victory in Jana Gana Mana of that Bhagya Bidhata [ed. God of Destiny] of India who has from age after age held steadfast the reins of India's chariot through rise and fall, through the straight path and the curved. That Lord of Destiny, that Reader of the Collective Mind of India, that Perennial Guide, could never be George V, George VI, or any other George. Even my official friend understood this about the song. After all, even if his admiration for the crown was excessive, he was not lacking in simple common sense." However, his clarifications on the controversy came only after the death of the Emperor George V in 1936, as Tagore himself didn't want to contradict it during the lifetime of the Emperor. Further, Tagore accepted the Knighthood on Jun 3rd on the birthday of Emperor George V in 1915 for his poetry and songs. The Knighthood was bestowed to Tagore on the wish of the Emperor George V, who was made to believe that the song 'Jana Gana Mana' was composed eugolising the Emperor. Tagore was hailed as a patriot who wrote other songs too apart from "Jana Gana Mana" lionising the Indian independence movement. He renounced his knighthood in protest against the 1919 Jallianwala Bagh Massacre. The Knighthood (i.e. the title of 'Sir') was conferred on him by the same King George V after receiving the Nobel Prize in Literature for "Gitanjali" from the government of Sweden. Two of Tagore's more politically charged compositions, "Chitto Jetha Bhayshunyo" ("Where the Mind is Without Fear", Gitanjali Poem #35) and "Ekla Chalo Re" ("If They Answer Not to Thy Call, Walk Alone"), gained mass appeal, with the latter favoured by Gandhi and Netaji. Another controversy is that only those provinces that were under British rule, i.e. Punjab, Sindh, Gujarat, Maratha, Dravid (South India), Odisha/Utkal and Bengal, were mentioned. None of the princely states – Kashmir, Rajasthan, Hyderabad, Mysore or Kerala – or the states in Northeast India, which are now integral parts of India were mentioned. But opponents of this proposition claim that Tagore mentioned only the border states of India to include complete India. Whether the princely states would form a part of a liberated Indian republic was a matter of debate even till Indian Independence. 'Dravida' includes the people from the south (though Dravida specifically means Tamil and even then, the same consideration is not given for the south since there are many distinct people whereas in the north each of the distinct people are named) and 'Jolodhi' (Stanza 1) is Sanskrit for "seas and oceans". Even North-East which was under British rule or holy rivers apart from Ganges and Yamuna are not mentioned to keep the song in its rhythm. India has 29 states, 7 union territories. In 2005, there were calls to delete the word "Sindh" and substitute it with the word Kashmir. The argument was that Sindh was no longer a part of India, having become part of Pakistan as a result of the Partition of 1947. Opponents of this proposal hold that the word "Sindh" refers to the Indus and to Sindhi culture, and that Sindhi people are an integral part of India's cultural fabric. The Supreme Court of India declined to change the national anthem and the wording remains unchanged. On 17 December 2013, MLA of Assam, Phani Bhushan Choudhury cited article of 'The Times of India' published on 26 January 1950, stating that originally the word 'Kamarup' was included in the song, but was later changed to 'Sindhu' and claimed that Kamarup should be re-included. To this, the then minister Rockybul Hussain replied that the state government would initiate steps in this regard after response from the newspaper. The debate was further joined by the then minister Ardhendu Dey, mentioning 'Sanchayita' (edited by Tagore himself) etc. where he said Kamrup was not mentioned. ^ "Know India-National Identity Elements-National Anthem". ^ "BBC News - Does India's national anthem extol the British?". ^ http://www.news18.com/news/india/national-anthem-of-india-a-brief-on-jana-gana-mana-498576.html Quote: "Though written in Bengali, the language used was sadhu Bengali or tatsama Bengali which was heavily sanskritised. Many of the words exist with the same meaning in different Indian languages and thus, all Indian people understand the words and meaning of the national anthem"
^ "National Symbol: National Anthem". National Portal of India. Retrieved 10 April 2017. ^ Britannica, Editors of Encyclopedia (2008), Britannica Encyclopedia of India (Set of 5 Volumes), Encyclopedia Britannica India, p. 167, ISBN 978-81-8131-008-8 CS1 maint: Extra text: authors list (link) Quote: "Adopted by the Constituent Assembly as the national anthem of India on January 24, 1950, the song Jana-gana-mana, in its Hindi version of the first stanza, was originally composed in Bengali by poet Rabindranath Tagore"
^ http://mha.gov.in/sites/upload_files/mha/files/pdf/NationalAnthem(E).pdf Quote: "The composition consisting of the words and music of the first stanza of the late poet Rabindra Nath Tagore’s song known as “Jana Gana Mana” is the National Anthem of India"
^ a b "National Anthem- National Identity Elements of India - Know India: National Portal of India". knowindia.gov.in (in Hindi). Archived from the original on 15 January 2013. Retrieved 11 April 2017. ^ Chowdhury, Arunangsu Roy. "100 years since 'Jana Gana Mana' was born". The Hindu. Retrieved 2017-04-11. ^ Bhattacharya, Sabyasachi (2011). Rabindranath Tagore : an interpretation. New Delhi: Viking, Penguin Books India. p. 206. ISBN 978-0670084555. Incidentally a myth regarding this song needs to be refuted and laid to rest. It is on record that the song was written on 11 December 1911. On 12 December 1911 the Delhi Durbar met to honour King Emperor George V. Obviously a poem written on 11 December could not be intended for an event the following day. The song was first sung at the twenty-seventh session of the Indian National Congress, Calcutta on 28 December 1911 as the opening song at the beginning of the day's proceedings. Thereafter it was also sung at the foundation day anniversary of Adi Brahma Samaj in February 1912 and included in their collection of psalms, Brahma Sangit. ^ Chandra, Balakrishnan, Pali, Vijay kumar. "100 Years Of Bollywood-Humrahi (1945)". indiavideo.org. Invis Multimedia Pvt. Ltd. Retrieved 14 August 2018. ^ "भारत के राष्ट्र गान के संबंध में आदेश" [Order relating to the national anthem of India] (PDF). mha.gov.in. Ministry of Home Affairs, Government of India. Retrieved 24 June 2018. ^ "Orders relating to the national anthem of India" (PDF). Ministry of Home Affairs, Government of India. Retrieved 18 June 2018. ^ "National Identity Elements - National Anthem - Know India: National Portal of India". knowindia.gov.in. Retrieved 2018-07-12. ^ "भरत के राष्ट्र गान के संबंध में आदेश" [Order relating to the national anthem of India] (PDF). mha.gov.in. Ministry of Home Affairs, Government of India. Retrieved 24 June 2018. ^ James Minahan. "The Complete Guide to National Symbols and Emblems [2 Volumes]". ABC-CLIO. p. 61. ^ "To sing or not to sing Vande Mataram". Indian Express. Retrieved 16 December 2013. ^ "Bijoe Emmanuel & Ors V. State of Kerala & Ors  INSC 167". indiankanoon.org. 11 August 1986. Retrieved 16 December 2013. ^ "National Anthem must be played before movies in theaters, rules Supreme Court". The Indian Express. 2016-12-01. Retrieved 2019-02-19. ^ "J&K: In a first, state govt employee amongst two arrested for not standing during national anthem". The Indian Express. 2017-02-11. Retrieved 2019-02-19. ^ "India anthem not mandatory in cinemas". BBC News. 2018-01-09. Retrieved 2019-02-19. ^ "Patriotism debate over national anthem". BBC News. 2015-11-30. Retrieved 2019-02-19. ^ "Playing of national anthem in cinema halls not mandatory: Supreme Court". The Times of India. Retrieved 2019-02-19. ^ "India anthem not mandatory in cinemas". 2018-01-09. Retrieved 2019-02-19. ^ "India anthem not mandatory in cinemas". BBC News. 2018. Retrieved 10 January 2018. ^ "Tagore and Jana Gana Mana". Monish R. Chatterjee. ^ "India: Are we still singing for the Empire?". Pradip Kumar Datta. ^ "Controversy Surrounding The Indian National Anthem". Rare India Fact. Archived from the original on 18 December 2012. Retrieved 23 June 2013. ^ "BBC News – Indian anthem Jana Gana Mana turns 100". Bbc.co.uk. 27 December 2011. Retrieved 8 July 2012. ^ a b Sanskrit transliteration "Bhārata-bhāgya-vidhātā"
^ a b Sanskrit transliteration "tava"